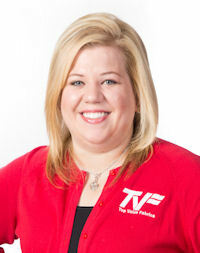 Katie Celmins is a Senior Sales Consultant for Top Value Fabrics. Katie has a background in Customer Service and Sales Coordination, and she joined Top Value Fabrics in 2006 as a Billing Specialist. Katie’s talents were quickly recognized and she has since served as order entry specialist, operations specialist, and sales assistant. Katie was promoted to Sales Consultant in March 2010 and is performing extremely well in her new role. Special interests include spending time with friends and family, riding her motorcycle, traveling and crafting. Katie has 3 fur-children which include two boxers named Brooke and Brodie and a pit bull mix, named Brinley.